St Stephen's Church was begun in 1849 and consecrated on 11th April 1850, the work of renowned architect Anthony Salvin (1799-1881) who built a considerable number of churches and large houses. He also restored castles, country houses and university buildings across Britain. St Stephen’s Church, a product of the Gothic revival, was built in the Decorated Style in Kentish Ragstone or Rubblestone with Ashlar dressings in Bath Stone, by Messrs Bird of Hammersmith. It is a so-called Church of England "Commissioners' church", one of many early 19th Century churches funded by a vote in Parliament as a result of the Church Building Act of 1818, and proposed in 1836 by the Bishop of London, the Rt Revd Charles James Blomfield. Bishop Blomfield is the figure represented in the carved newel post to the pulpit stairs, and he is believed to have borne the entire cost of building the church out of his own purse. The church tower, of stone-faced brick construction, originally supported four stone pinnacles and a spire some 150 feet high. 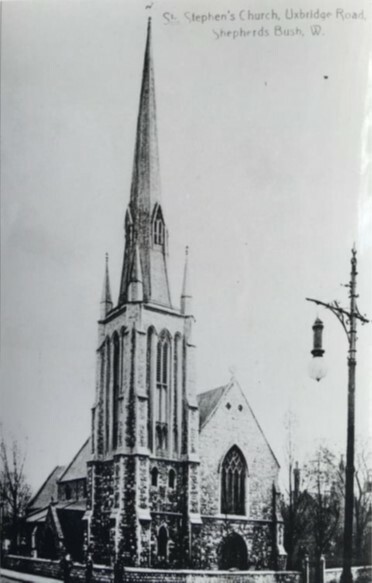 The church was consecrated on April 11, 1850 and was filled to capacity with 600 people for the ceremony. A periodical The Ecclesiologist, which was strongly in favour of the Gothic Revival movement, commented that the new church: "has a peculiar value, as indicating how far our diocesan is willing to take the peculiar responsibility of those various features of the arrangements and decoration, which from desuetude had become to a great extent novelties in England when we first advocated their revival" . The interior of the church was admired for its “very well developed chancel”, which is large and lofty . The font was a gift from the churchwardens of Finchley and the Bishop of London presented the church with a fine silver alms plate. The oldest stained glass windows were manufactured by William Wailes and were donated by members of the clergy and other well-wishers. The first vicar of St Stephen’s was Canon William Cooke, an Honorary Canon of Chester Cathedral and scholar of early music, who translated a number of hymns into English from the original German. In 1851, the church school, also designed by Salvin, was opened on land adjacent to the church. It was the first to be opened in the district, and the vicarage was added some two decades later. Initially, St Stephen’s Church stood amid fields and orchards, and the District Parish of St Stephen Hammersmith extended north as far as Harrow Road and west as far as Acton Lane. See original parish map, left. There were large houses along the main roads and also some outlying farms, but the parish was not densely settled. As the 19th century drew on, the pace of development increased and many of the roads and houses in the parish today were built in the last quarter of the century. The position of the church and school made them central features in the landscape of Shepherds Bush, and around them much of this new development was clustered. By 1861 the population had increased to 6,500, and when in 1871 the figure had grown to 9,000 most of the Western portion of the parish was allocated to St Luke’s Church, which was built on Uxbridge Road in 1872. Further divisions of the parish took place as the population grew, and so great was the pressure on St Stephen’s Church that in 1872 the Infants’ School had to be used for services . Uxbridge Road was an important route to and from the West Country, and Shepherds Bush Green was the traditional place for sheep drovers to fatten up their flocks after their long journey from the Cotswolds and before the final day’s journey to Smithfield Market. In 1876, Shepherds Bush was regarded by one publication as being a place of little interest to anyone, with a treeless common used only by boys playing cricket. But early in the 20th century, a great change took place in the district with the development of exhibition grounds covering 140 acres to the north of Uxbridge Road. This was first the location of the Franco-British Exhibition of 1908, and the grounds were used for a further five grand exhibitions and events in the years leading up to 1914. All the exhibition pavilions were painted white or faced in white marble, and as a consequence the area became known as the White City. As Shepherds Bush grew up around the church, further noteworthy establishments were built in the area: the Gaumont Studios, later bought by BBC television for live and current affairs broadcasting, Bush Hall, which was a dance hall, and the Passmore Edwards Public Library further along Uxbridge Road. 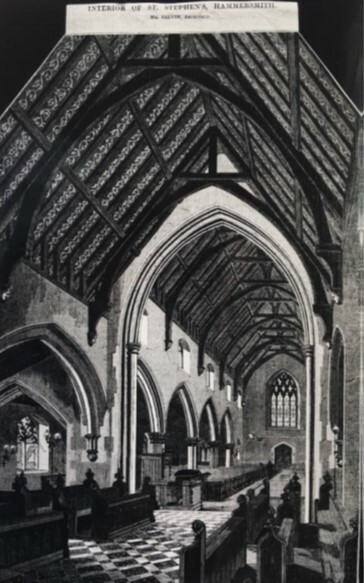 The Church responded to the increase in population and extended in 1909 to add a further vestry above a boiler house on the south side of the building, while further classrooms were added to the school. During a bombing raid in 1940, the church was badly damaged when a bomb destroyed the police station on the opposite side of Uxbridge Road. The elegant spire and accompanying pinnacles were damaged and deemed to be beyond repair. The church was largely put beyond use and remained under scaffolding until its reopening in 1949. When the church was restored, (by D G Martin) the spire and pinnacles were removed and replaced by the timber copper-covered fleche we see today. In the same air raid, the stained-glass windows on the North side of the church were almost totally destroyed, with a few fragments and tracery being the only survival of the original glass, and the great East and West windows were both irreparably damaged. See photo of interior in 1949, left. Upon re-opening, the damaged East window was replaced with a depiction of Christ in Majesty flanked by saints (by Goddard & Gibbs, 1951) the West window remains as clear glass to this day. On the South side of the church, the windows were repaired where possible but of the middle window, only the tracery survived. In 1953, a mission church was built in the White City Estate, which lies within the parish, and was dedicated to St Michael & St George, two of the saints depicted in St Stephen’s new East window. The mission church was intended to serve the residents of the Estate, which had been built in the late 1930s on land previously occupied by part of the 1908 Franco-British Exhibition. The stadium where the Olympic Games of 1908 were held was built nearby; later it became a greyhound racetrack and athletics stadium, and subsequently the BBC’s Media Village. The post-war years and 1950s saw immigration from the West Indies on a substantial scale, and many new arrivals were settled in Shepherds Bush. St Stephen’s became known as one of the churches that warmly welcomed what became known as the Windrush Generation, and their welcome was reinforced in 1962 by the appointment of Barbadian-born Rev Wilfred Wood to Shepherds Bush for his first curacy. A lifelong champion of racial justice, in 1985 he became the Church of England’s first black bishop, and remained Bishop of Croydon until his retirement in 2002. Bishop Wood’s influence is felt to this day and many West Indian families are rooted in St Stephen’s. In 1960, the neighbouring church of St Thomas in Godolphin Road was closed, and the two benefices were united in 1962; at this point the parish became known as The Parish of St Stephen & St Thomas. Since 1965 the former St Thomas’s Church has been rented to the Greek Orthodox Archdiocese of Thyateira and Great Britain, and is now known as the Greek Orthodox Cathedral of St Nicholas. In the 1960s, the Rev John Asbridge, the vicar at the time, perceived that the desperate need for housing was hindering the social and spiritual well-being of many poor families, and in 1966, he decided to set up the Shepherds Bush Housing Association. The choir vestry at St Stephen’s became the Association’s first office, which was run by volunteers from the parish. Initial help came from a small number of parishioners who gifted to the association their own houses for use by homeless people; in return they were provided with smaller flats that were more appropriate to the size of their households. In the early 1980’s St Stephen’s was cleaned externally and the once blackened stone exterior was largely restored to its original colour. The process was completed with an internal refurbishment in 1987, with funds bequeathed by a former parishioner, Eleanor Margaret Wright. During this refurbishment, new altar frontals and textiles were commissioned from Juliet Hemingray, an interior lobby (formed from the old altar screen) was glazed in, the ground floor of the tower which was formerly a chapel dedicated to St Thomas, was made into a sitting out and crèche area while the altar rail was removed and the sanctuary step straightened. Three stained glass windows, reclaimed from a church in Barnstaple contemporaneous to St Stephen’s, were installed, two on the North side aisle and one in the Lady Chapel. Four of the church’s original stained glass windows remain, all on the South side of the church, and mostly by Clayton & Bell of London or Hardman & Co of Birmingham, both of them well known Victorian stained glass window companies. In 2000, to commemorate the 150th anniversary of the church’s consecration, a new stained glass window was commissioned from Meg Lawrence for the vacant window on the South side of the church (completed 2005). In the two lancets are depicted St Stephen (left) and St Thomas (right), with the text from Acts: ‘You shall be my witnesses in Jerusalem…and to the ends of the earth’. Further explanatory notes to this window are available. The church has a single bell by Mears of Whitechapel London, 1849, which is rung before services on Sunday. The organ, built in 1888 by Henry Willis for St Andrew’s Church, Haverstock Hill, was restored and installed in 1958 by N P Mander Ltd during a major re-arrangement of the church. Among the church’s monuments is a memorial to ninety-one men of Shepherds Bush who lost their lives in the First World War. A major redevelopment took place in 2009, which added a purpose-built hall adjacent to the church across an open courtyard with a garden. The same project allowed for an upgrade of the church interior providing a larger open space around the font and an increase in natural light through glass doors. The ground floor of the tower was converted to a small serving kitchen, and the former choir vestry became a link to the church hall, incorporating a new toilet and a crèche room. The former curate’s house, comprising the northern end of the vicarage, was purchased by the parish and transformed into a self-contained key worker flat on the ground floor with meeting rooms on the upper floor. This was linked to the newly built hall and parish office, which was designed by Oliver West of Oliver West and John Scott Architects Ltd.
During most of the church’s existence, the style of worship has been High Church, initially following the Anglo-Catholic tradition that stemmed from the Oxford movement in the 19th century. During the later years of the 20th century, worship became less formal, although to this day vestiges of the church’s earlier traditions prevail. Today, St Stephen’s is at the centre of a multi-cultural community; two further Christian congregations also use the church for their worship, and concerts, gigs, meetings, conferences and school assemblies are also held there. In the hall that adjoins, local groups serve the educational and outreach needs of the community. A weekly lunchtime film club for the elderly takes place, followed by an evening film club where each week between 70 and 100 homeless and hostel dwellers are served a hot meal, watch a film and receive clothing if they need it. The church nurtures its long held links with St Stephen’s C of E Primary School, which forms part of the same range of buildings. As a hub for the local community, the church provides a social, visual and spiritual amenity, ensuring a valuable role in this century and into the future.